Gluten free pasta available. All other pasta dishes are served with fresh garlic bread. Lasagna made with fresh homemade meat sauce and mozzarella. Manicotti pasta stuffed with spinach and ricotta cheese. Penne pasta with fresh tomato sauce. Vodka sauce made with fresh plum tomatoes, cream and mozzarella. Curley-shaped pasta with fresh homemade tomato meat sauce. 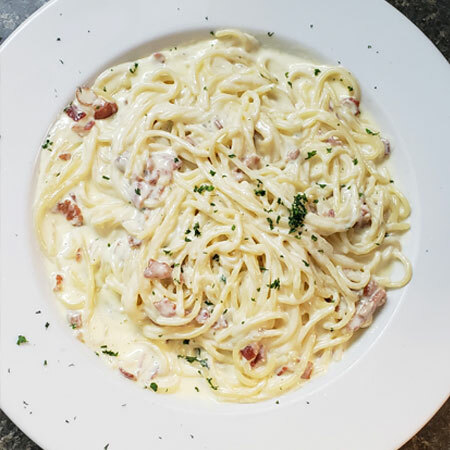 Crisp bacon sauteed and tossed with cooked spaghetti, beaten eggs and a generous measure of parmesan cheese. Sauteed vegetables served in white cream sauce over fettuccini. Pasta with scallops, grilled calamari, mussels, and shrimp with choice of white wine sauce or fresh tomato sauce. Creamy Italian rice sauteed in gorgonzola cheese with mixed steamed vegetables. Risotto with‏ scallops, grilled calamari, mussels, and shrimp with choice of white wine sauce or fresh tomato sauce. 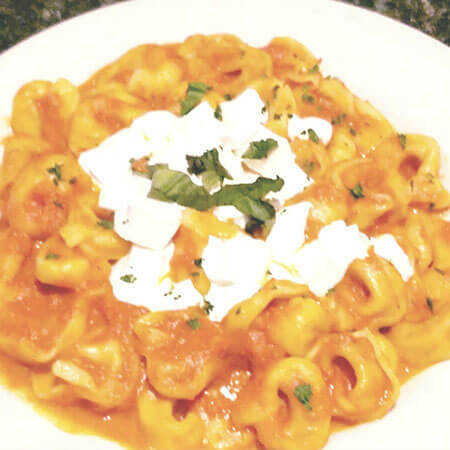 Cheese tortellini in our homemade vodka sauce, topped with homemade mozzarella and basil. Mozzarella, ricotta & parmesan ravioli served with a tomato sauce & basil. Spinach, mozarella & ricotta ravioli served with white cream sauce. Beef and cheese ravioli served with a bolognese sauce. Olives, Eggplant, peppers, ricotta & parmesan ravioli served with vodka sauce. Crab meat & mascarpone cheese served with vodka sauce.